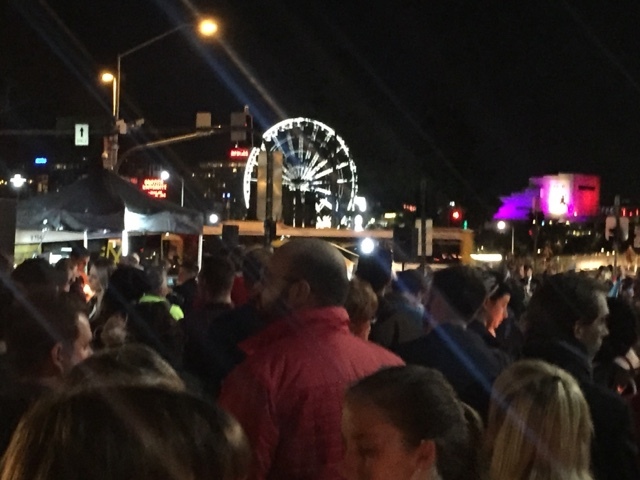 My husband Mitchell and I, and probably two thousand other people (it was a BIG crowd) turned up last night for a candlelight vigil to commemorate the victims of the Pulse shootings in Orlando. 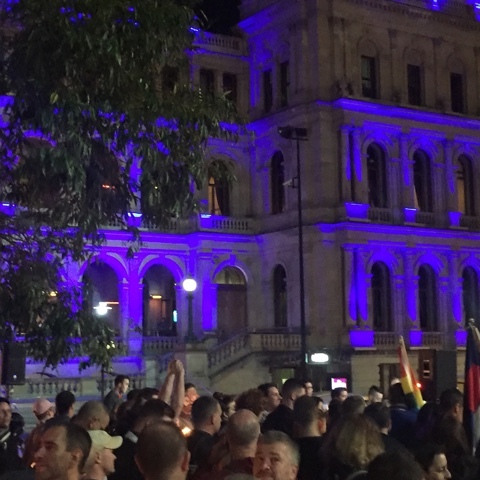 There were extraordinarily moving speeches, including by Brisbane Pride chair Deeje Hancock, and local politicians Terri Butler, Deputy Premier Jackie Trad, and Councillor Vicki Howard. I am sick and tired of the homophobic attitudes displayed so rawly in Orlando. I am glad that my friends and colleagues in that part of the world are safe and well. One of them did not check in for a while, and I was concerned that he had died, but thankfully he is safe and well, too. Since the awful spray of hate, we have seen some bigots who have proclaimed that the loss of these innocents was a good thing. Those people who spout this evil disgust me. They perpetrate the same evil that happens when my husband and I walk down the street. We hold hands. Too often we cop evil glares- often from straight couples who are, surprise, surprise, also holding hands. Sometimes we cop homophobic abuse. This evil, which feeds attitudes displayed by the killer in Orlando, must be stopped. We have copped this abuse in Brisbane, Sydney (worse) and Melbourne (worst of them all). It has to stop. We have to get along and live with each and accept that we are different, but equals. I am glad so many people came out last night to the rally. I am glad that the politicians of both stripes showed true leadership. I am glad that Queensland's Parliament House was lit up in rainbow colours, as was the Treasury Casino. 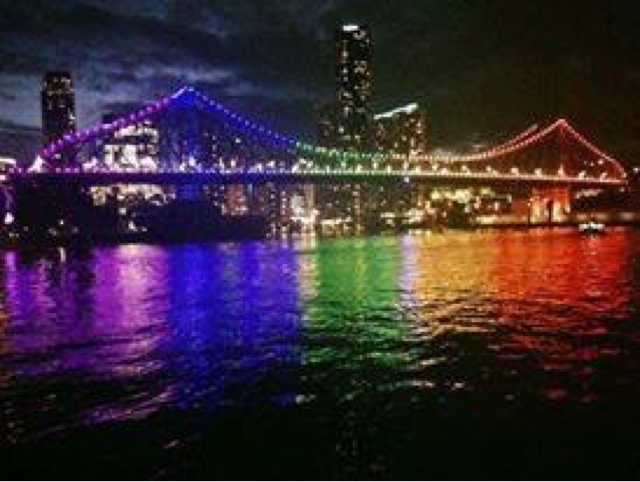 I am glad that the Story Bridge was lit up in rainbow colours the night before, and the Victoria Bridge in red, white and blue. 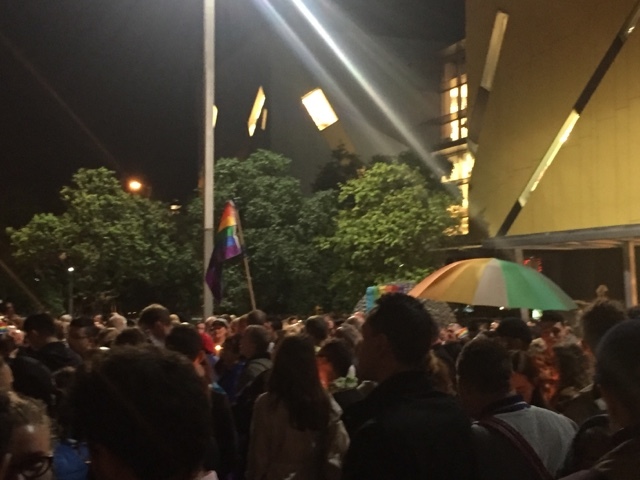 I am glad that while the rally happened, the two pointers and the Southern Cross peaked out behind the clouds and said as if a measure of comfort, reassurance and safety- we are here, we are safe, we are equal.